Falling can be a serious problem in older adults. In fact, taking a tumble can result in anything from a broken hip to a head injury. According to a study that evaluated predictors for falls in seniors, one in three adults over the age of 65 experiences a fall each year. Unfortunately, many seniors don't bring this problem up with their care providers. Falls are not always caused by uneven surfaces or loose shoes. Rather, falling can be a result of balance problems, especially for seniors. To complete this exercise, seniors must walk about 10 to 20 steps, placing one foot directly in front of the other. Ideally, the heel of the front foot should touch the toes of the back foot. Even if seniors can't get their feet to touch, they should still try to get them as close as possible. To help remain stable, they can focus on a stationary point ahead of them and walk straight forward. Standing up from the seated position can easily cause falls. The dramatic shift in body weight can make anyone lose their balance, and many seniors move from sitting in a chair to standing every day. Everyday Health suggests older adults practice this routine task to reduce their risk for falls. To complete this exercise, seniors should sit in a chair with their feet planted flat on the ground. Then, they should stand up without using the chair's arms for assistance. In this situation, they may want a family member or friend to help keep them steady during the first few attempts. 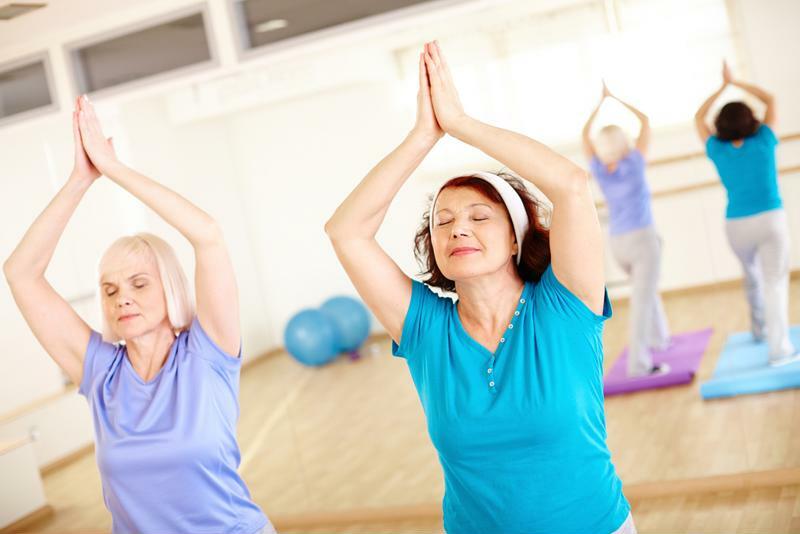 Seniors can take advantage of the many group activities provided at their retirement community by signing up for a tai chi or yoga class. These forms of exercise have long been known to improve balance. By signing up for a class, seniors can improve their stability and make new friends. Enrolling in a group exercise class may help improve balance. If busy schedules don't allow for time dedicated to balance exercises or joining a group activity, seniors can still enhance their stability while doing everyday tasks. For example, while brushing their teeth, seniors can work on equilibrium by standing on one foot. To complete this task, they should slightly lift the left foot off of the ground while brushing with the left hand. Repeat the same process on the right side. "For all of these exercises, some seniors may need assistance." Uneven surfaces can be difficult for seniors to handle, so learning how to adjust their natural step to accommodate for ramps and random objects may reduce their chances of falling. Seniors can practice this by placing a small, soft object on the floor like a child's teddy bear. Then, they can step forward and backward over the item repeatedly. For all of these exercises, some seniors may need assistance. Staff at their assisted living communities should be able to help older adults rework their balance. They can lend anything from a steady hand to some helpful advice. Some balance problems stem from conditions that can't be combated with exercise. According to the National Institute of Health, the inner ear plays a large role in helping the body maintain balance, and disturbances in this part of the ear are a common cause for balance problems such as dizziness, feeling lightheaded and being unsteady. Additionally, failing eyesight and weakening muscles may lead to falls. Seniors experiencing these problems may want to speak with their physicians to determine whether there is a more serious internal problem causing balance issues.